Product prices and availability are accurate as of 2019-03-24 22:32:22 EDT and are subject to change. Any price and availability information displayed on http://www.amazon.com/ at the time of purchase will apply to the purchase of this product. Grow your own culinary herbs right in your own kitchen with this rustic planter box made from reclaimed barn wood. 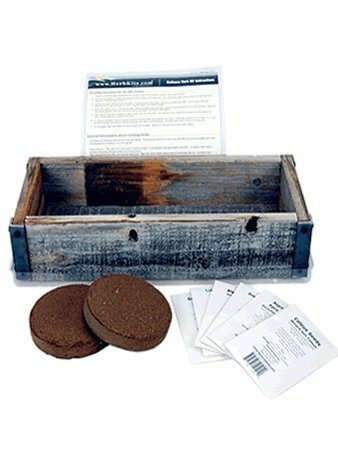 Complete kit includes barnwood planter, drip tray, compressed soil, instructions and selection of 6 herb seeds. This amazing rustic planter box made from reclaimed barnwood (includes clear plastic drip dray) is ideal for growing an indoor kitchen herb garden. 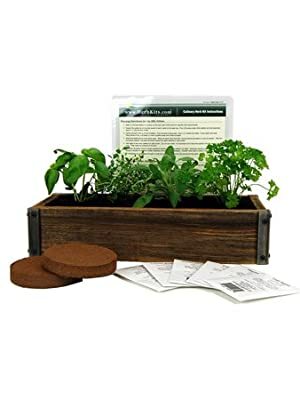 An attractive addition to any home or kitchen, the complete kit is everything you need to grow the most popular cooking herbs right in your own kitchen. The kit includes 6 varieties of herb seeds, each pack enough to plant the entire barnwood planter box, but you can mix and match with up to 4 herbs of your choice. 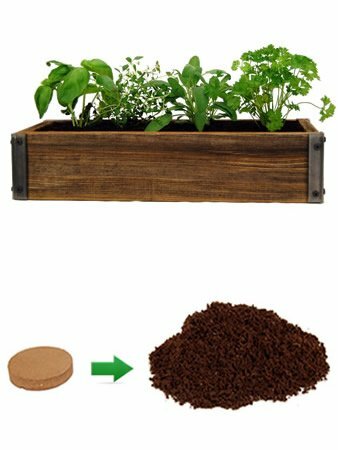 The barnwood herb garden kit also includes compressed soil disks and detailed instructions. It is everything you need to start growing right away. Just add water.